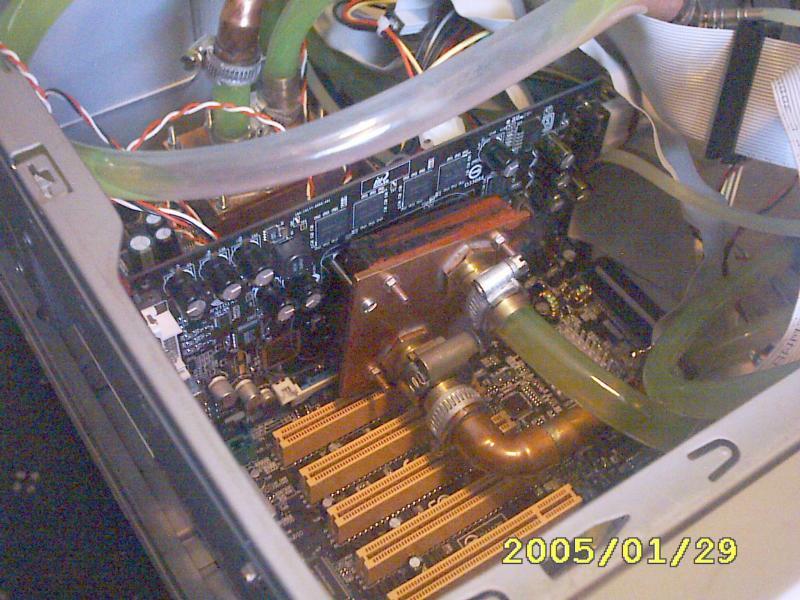 This is the second version of the PC water cooling project, the first is Here. 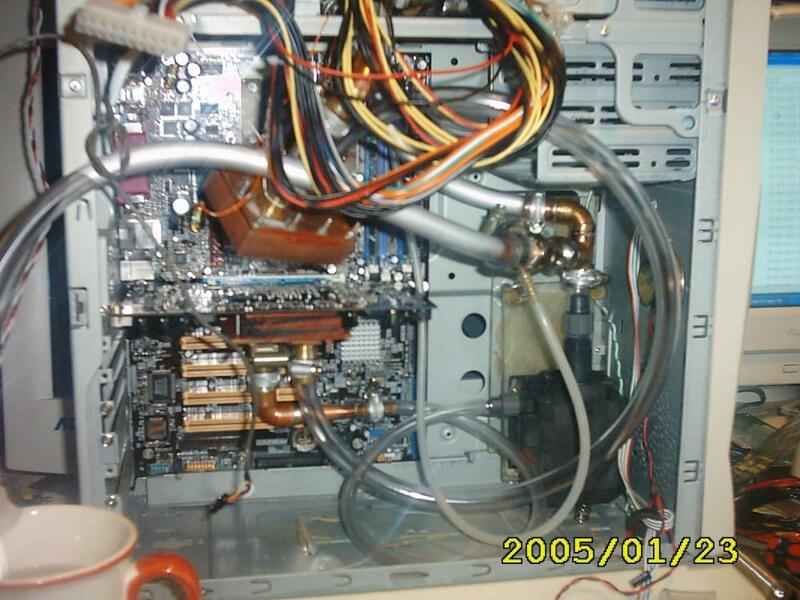 My machine was upgraded to a XP2800+ with GF4 5900XT graphics card, the existing cooling system wasn't good enough so the machine spent many months air cooled with the water blocks hanging in thin air. This time, the water blocks were much bigger with much more surface area. 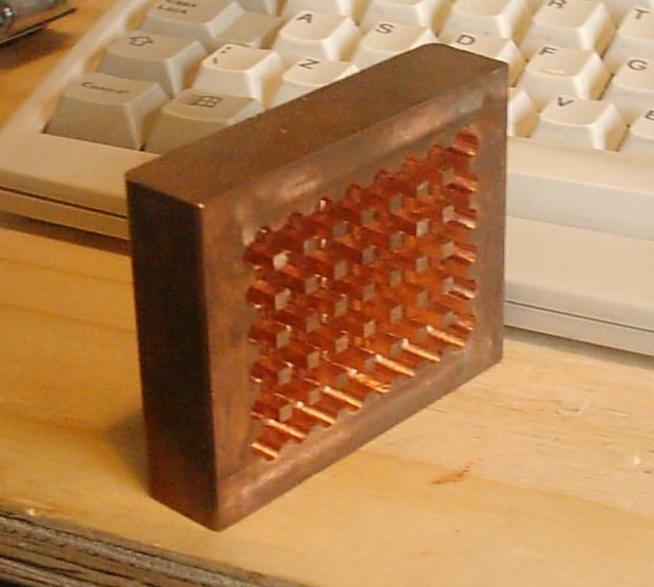 I also bought a proper heater matrix (Danger Den all copper, about 35 UKP) instead of making a radiator. 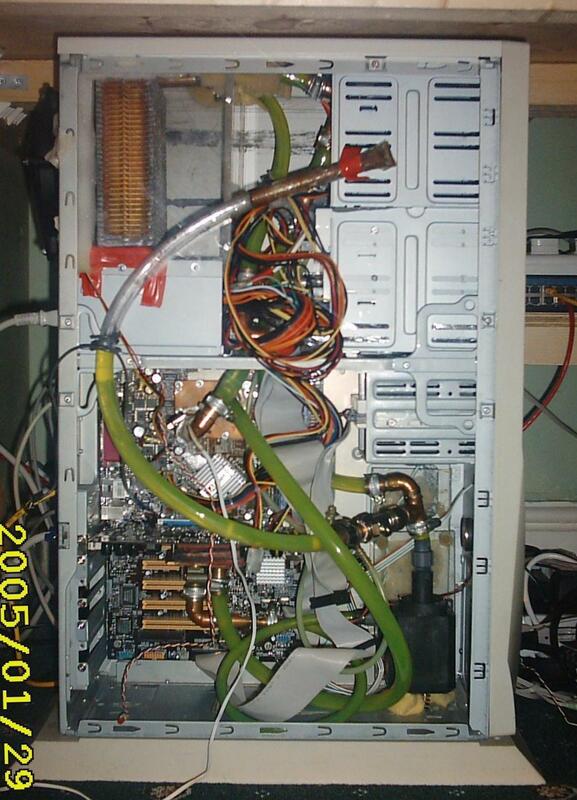 Also, I decided not to water cool the PSU, this time cooling the PSU from the air as it exited the heater matrix. Another difference is the use of mostly 12mm pipe instead of 8mm, this turned out to be a mistake as the 12mm doesn't like to bend inside the limited space of the PC case. Also, instead of pure glycol (which turned out to degrade to crystals after a few months, coating all surfaces in the thin white layer), I used distilled water and added a Fernox clone (Travis Perkins central heating additive) and a small amount of Water Wetter clone (Forte Cooling System Conditioner). So we shall see how that ages. 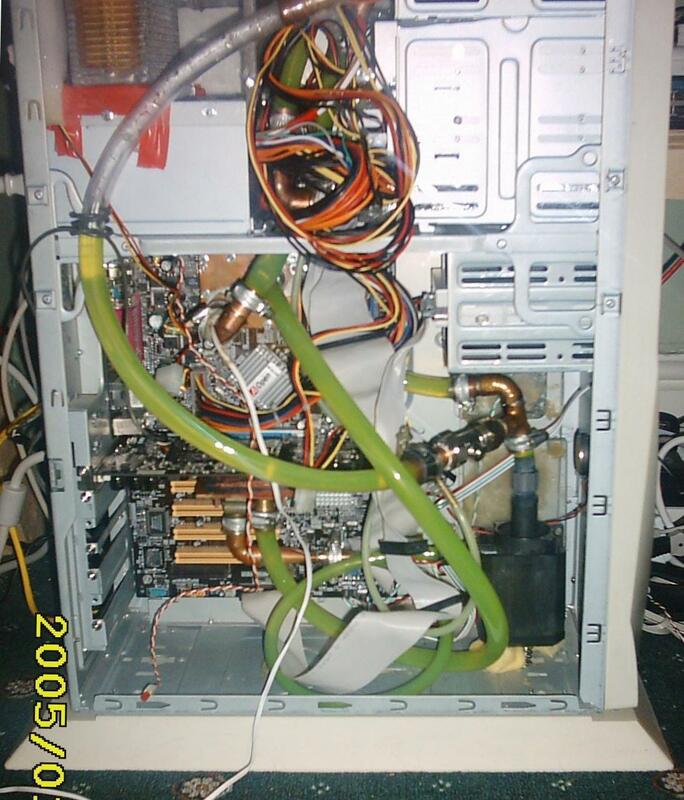 Also moved the pump toward the front of the case, taking it away from the motherboard and generally out of the way. This also meant the pump was vertical, which makes no real difference. 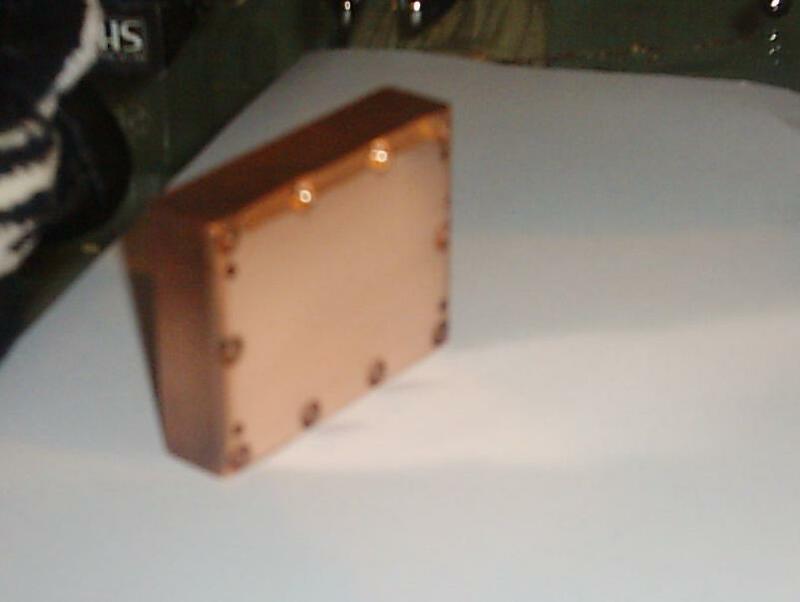 The first picture is the GPU water block, this was a standard 1U AMD heatsink and fan combo, molded solid copper with an array of 1.5mm pins. The outer set of pins were removed and a perspex spacer was cut out to form the sides. Shown in other pics is the copper lid with brass barbs, the whole assembly was sealed with red silicon and bolted together on each of the four corners. This picture shows the base CPU water block, through the fuzzyness, on the top is the cut out for the AMD socket, there are 10 recessed holes for bolt heads, and 4 holes for mounting to the motherboard. The base was lapped with 80, 180, 240, 400, 600, 800, 1200 grade grits and had a really nice glow to it. 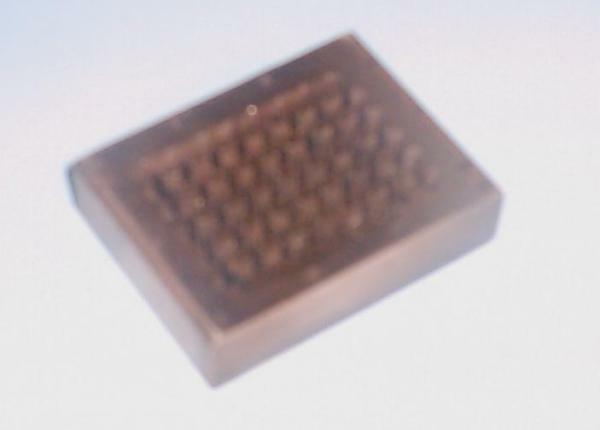 This is the top/inside of the CPU block, it was milled out by hand of solid block of copper to have approx 3mm square pins, with approx 3mm gaps between pins. The block was 19mm thick, and was milled out to 13mm deep. 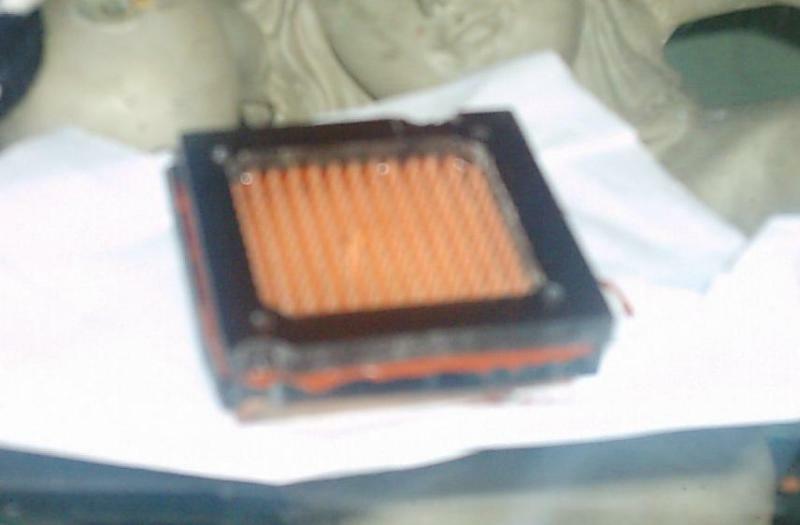 This is the water block with its lid on, again it sealed with red silicon. After sealing the system and bleeding it, I looked at the above pictures and saw how bad they were. 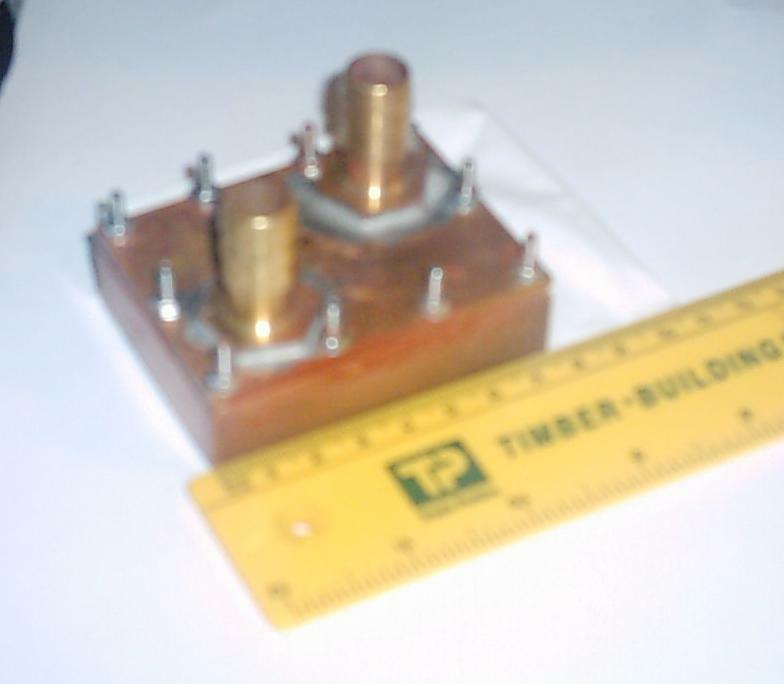 I'm not taking it apart to take better pictures, so this is another example of the CPU water block that I had made but didn't use. This is the same size as the other CPU block, but the gap between pins is 4mm not 3mm, and the milling depth is 9mm instead of 13mm. This was CNC cut and so looks more professional, but then again, the larger diameter and the reduced depth were because it was CNC cut. 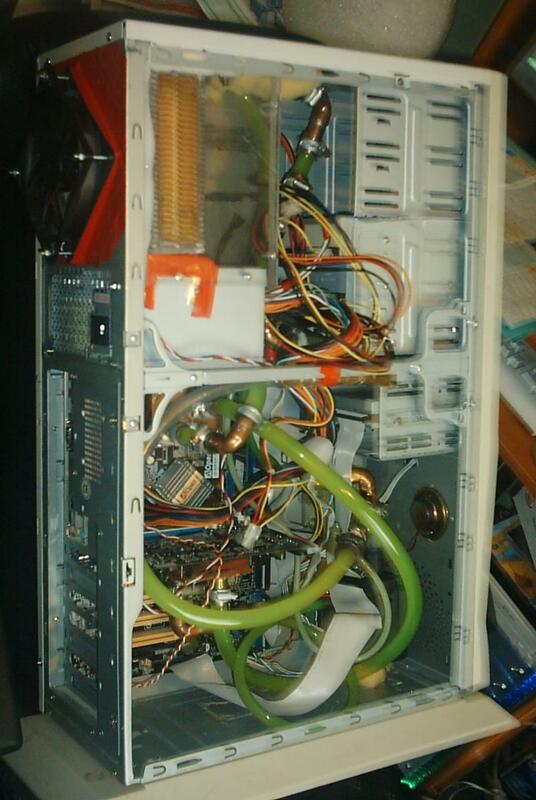 This picture shows the top half of the case, can easily see the heater matrix, and the slightly modified PSU to account for the matrix being slightly larger than the gap between the top of the PSU and the top of the case allowed. 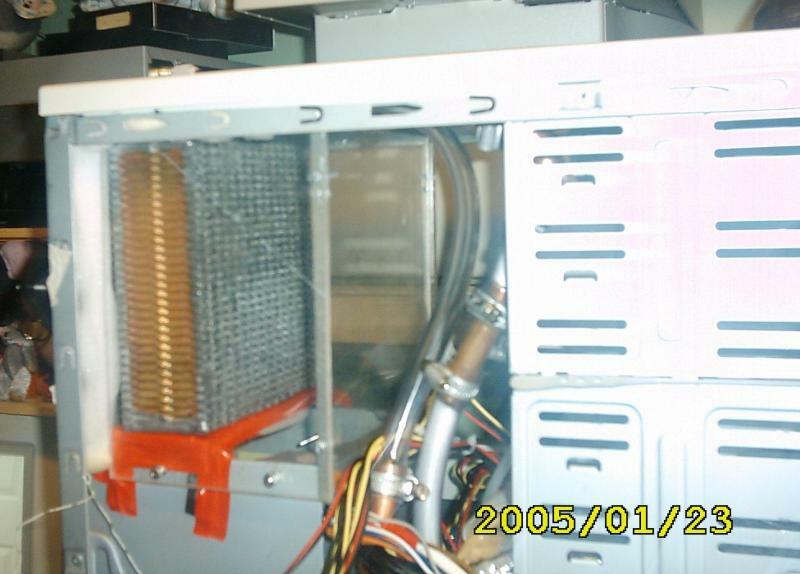 The 12cm fan on the outside of the case blows into the case through the heater matrix, the air then flows down under the heater core and through the PSU and out. The hard part was mounting the heater core, the top of the core is held in place by a molded lump of silicon which was molded to fit the radiator and be glued to the top of the case. The silicon isn't stuck to the core, the shape of the silicon holds the core. Metal L brackets were then added to the PSU to support the base of the core, with a little foam for padding. 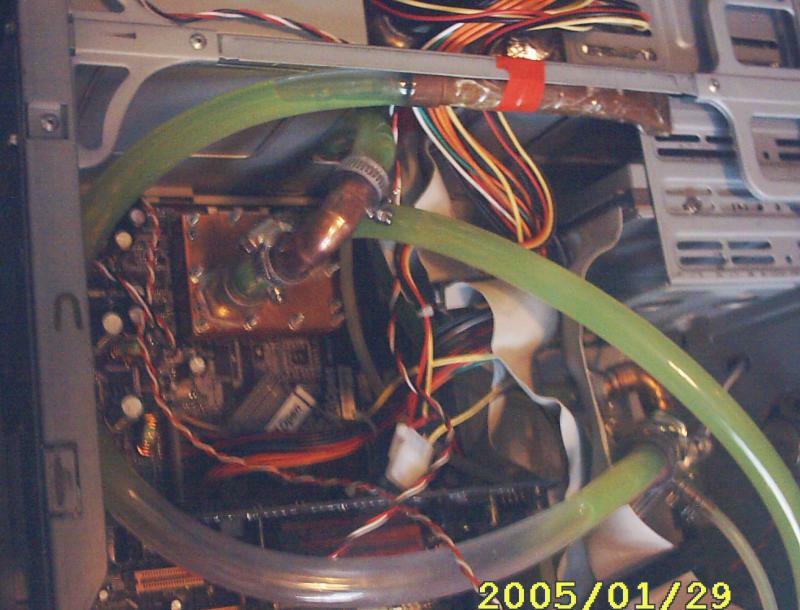 Perspex sides surround the heater core, that and some foam make a tunnel that guides the air down and through the PSU. 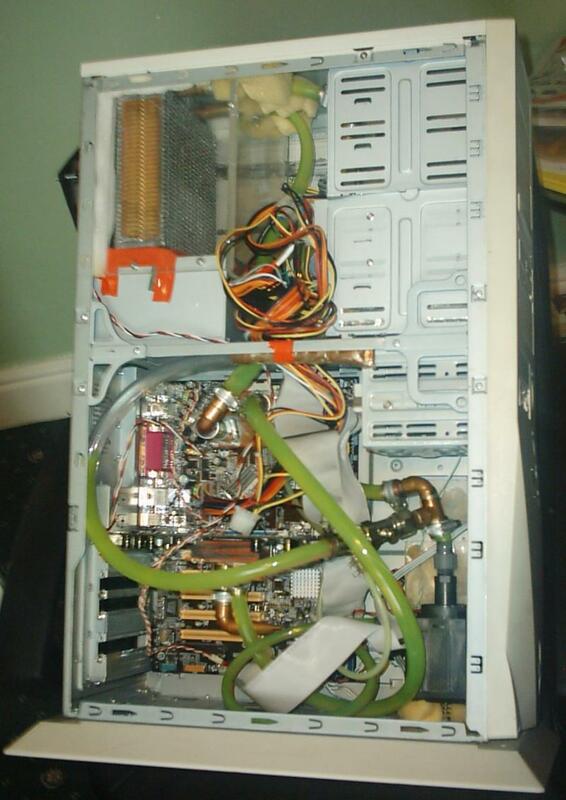 The bottom of the case shows the fully plumbed in bottom half of the case. 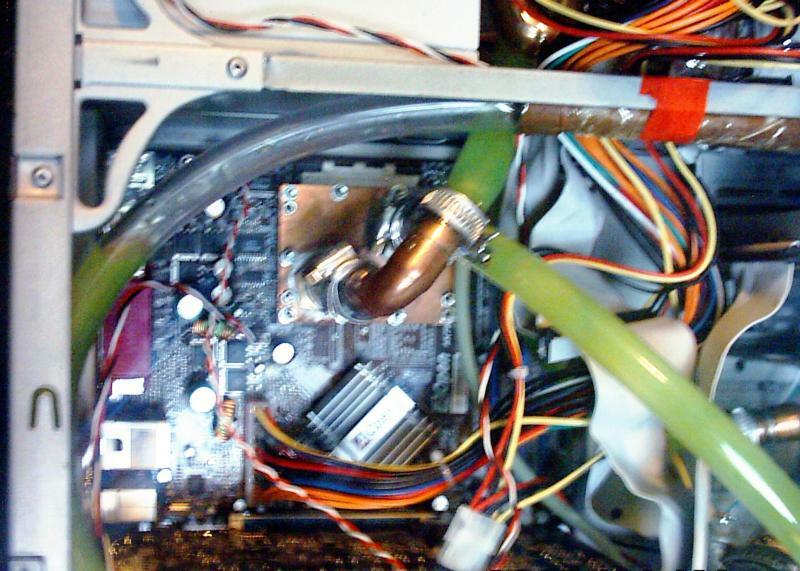 The pump outlet is on the left of the pump, this goes through a loop of 8mm pipe is converted to 15mm pipe and then enters the GPU water block, it then loops around and goes into the CPU water block. 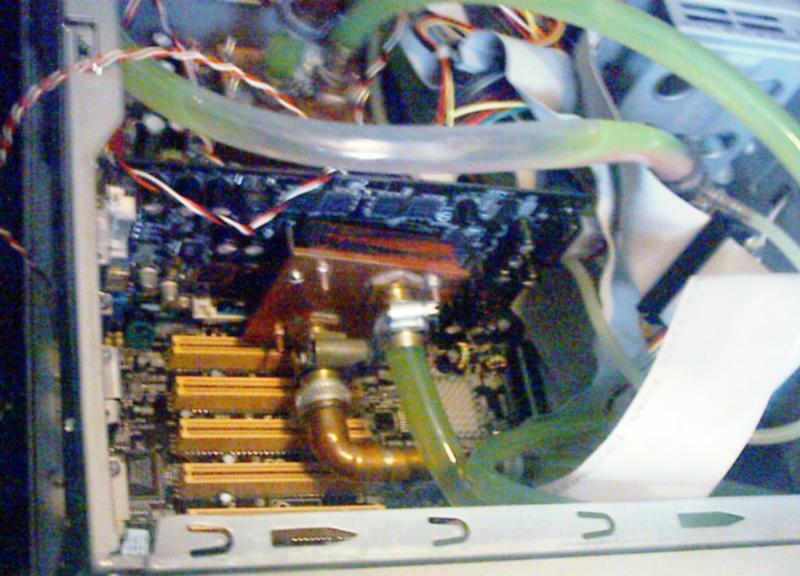 From the CPU water block, it goes up just out of view and enters the harddrive cooler. From there it goes to the heater core, and then back to the top of the pump. Other plumbing here is the filler tube, that runs of to the left and off the picture, from this a small bore silicon tube runs to somewhere else in the loop. An isolation valve on the filler tube can be closed, sealing off the system from the filler tube. The fluid can still expand into the filler tube via the small bore silicon tube. 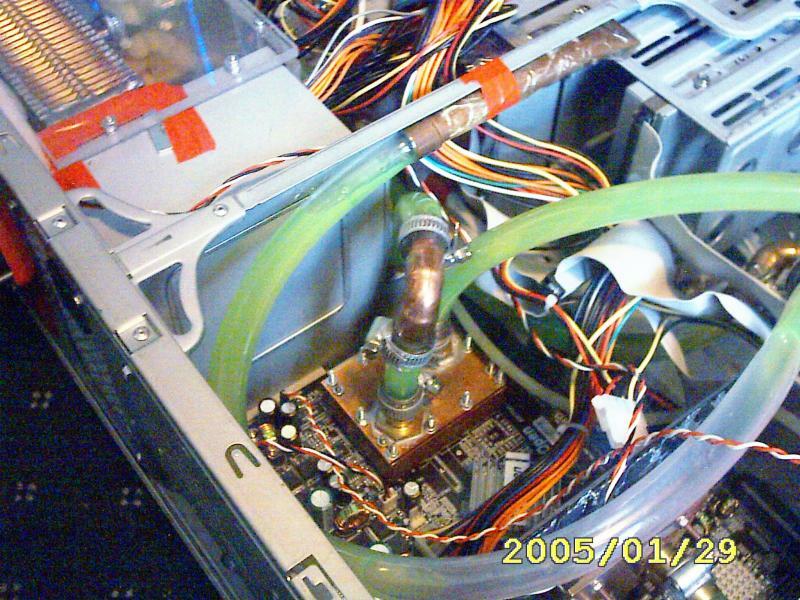 The idea being, once the system is blead, the valve can be close and the whole PC will travel any way up without moving any air into the system. 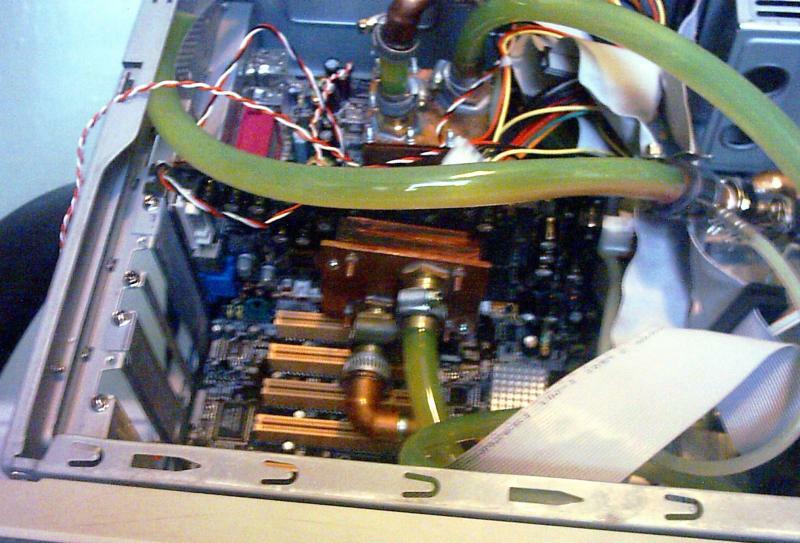 This next picture shows the filled system, the green colour coming from the Forte Cooling System Conditioner. The filler tube is in this position for bleeding, later it moves to rotate around the bottom of the case.